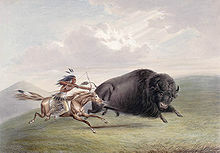 Bison hunting (hunting of the American bison, also commonly known as the American buffalo) was an activity fundamental to the economy and society of the Plains Indians peoples who inhabited the vast grasslands on the Interior Plains of North America, prior to the animal's near-extinction in the late nineteenth century. Even a number of Indians west of the continental divide crossed the Rocky Mountains in traditional tribal hunts on the Northern Great Plains. The species' dramatic decline was the result of habitat loss due to the expansion of ranching and farming in western North America, industrial-scale hunting practiced by non-indigenous hunters, increased indigenous hunting pressure due to non-indigenous demand for bison hides and meat, and even cases of deliberate policy by settler governments to destroy the food source of the native Indian peoples during times of conflict. The steppe bison (Bison priscus) was found in North America more than a million years ago, well before the first humans are believed to have arrived. It is believed to have evolved into the giant Ice Age bison (Bison latifrons) which lived from 200,000 years ago to 30,000 years ago. It was in turn replaced by Bison occidentalis, which is believed to have come from Eurasia, and Bison antiquus which evolved separately from B. priscus. The first human arrivals in North America, the Paleo-Indians, are believed to have hunted these last two species (occidentalis and antiquus), but did not rely on them to the exclusion of other large herbavorous mammals such as mammoths, mastodons, camels, horses, and ground sloths. Around 11,000–10,000 years ago, however, the majority of the large game species in North America became extinct, possibly due to overhunting, or some combination of these and other factors. One of the few large survivors was B. antiquus, but its average size declined until it evolved into the smaller modern American bison around 5,000 years ago. Bison and Indians of De Bry, 1595. Pedro Castaneda, a soldier with Coronado on the Southern Plains in 1542, compared the bison with "fish in the sea". The modern American bison is split into two subspecies, the wood bison in the boreal forests of what is now Canada, and the plains bison on the prairies extending from Canada to Mexico. 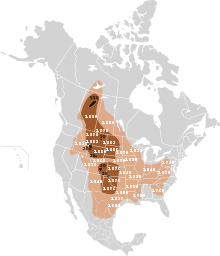 The plains subspecies became the dominant animal of the prairies of North America, where bison were a keystone species, whose grazing and trampling pressure was a force that shaped the ecology of the Great Plains as strongly as periodic prairie fires and which were central to the survival of many American Indians of the Great Plains. To the corn-growing village Indians, it was a valued second food source. However, there is now some controversy over their interaction. Charles C. Mann wrote in 1491: New Revelations of the Americas Before Columbus, pages 367 ff, "Hernando De Soto's expedition staggered through the Southeast for four years in the early 16th century and saw hordes of people but apparently didn't see a single bison." Mann discussed the evidence that Native Americans not only created (by selective use of fire) the large grasslands that provided the bison's ideal habitat but also kept the bison population regulated. In this theory, it was only when the original human population was devastated by wave after wave of epidemic (from diseases of Europeans) after the 16th century that the bison herds propagated wildly. In such a view, the seas of bison herds that stretched to the horizon were a symptom of an ecology out of balance, only rendered possible by decades of heavier-than-average rainfall. Other evidence of the arrival circa 1550–1600 in the savannas of the eastern seaboard includes the lack of places which southeast natives named after buffalo. Bison were the most numerous single species of large wild mammal on Earth. Russel Means states that bison were killed by using a method that coyotes implemented. Coyotes will sometimes cut one bison off from the herd and chase it in a circle until the animal collapsed or gave up due to exhaustion. Ulm Pishkun. Buffalo jump, SW of Great Falls, Montana. The Blackfoot drove bison over cliffs in the autumn to secure the winter supply. Animals not killed in the fall were trapped and killed in a corral at the foot of the cliffs. The Blackfoot used pishkuns as late as the 1850s. Working on foot, a few groups of Native Americans at times used fires to channel an entire herd of buffalo over a cliff, killing far more than they could use. The Olsen–Chubbuck archaeological site in Colorado reveals some techniques, which may or may not have been widely used. The method involves skinning down the back in order to get at the tender meat just beneath the surface, the area known as the "hatched area". After the removal of the hatched area, the front legs are cut off as well as the shoulder blades. Doing so exposes the hump meat (in the Wood Bison), as well as the meat of the ribs and the Bison's inner organs. After everything was exposed, the spine was then severed and the pelvis and hind legs removed. Finally, the neck and head were removed as one. This allowed for the tough meat to be dried and made into pemmican. Castaneda saw Indian women butchering bison with a flint fixed in a short stick. He admired how quickly they completed the task. Blood to drink was filled in emptied guts, which were carried around the neck. A Crow Indian historian has related a number of ways to get bison. By the help of songs, hazers, drive lines of stones and a medicine man pointing down the line with a pair of hindquarters in his hands, the Crows drove many bison over a cliff. A successful drive could give 700 animals. During winter, Chief One Heart's camp would maneuver the game out on slick ice, where it was easier to kill with hunting weapons. Henry Kelsey described a hunt on the northern plains in 1691. First, the Indians surrounded a herd. Then they would "gather themselves into a smaller Compass Keeping ye Beast still in ye middle". The hunters killed as many as they could before the animals broke through the human ring. In the dog days, the women of a Blackfoot camp made a curved fence of travois' tied together, front end up. Runners drove the game towards the enclosure, where hunters waited with lances as well as bows and arrows. The Hidatsa near Missouri River confined the buffalo on the weakest ice at the end of winter. When it cracked, the current swept the animals down under thicker ice. The people hauled the drowned animals ashore, when they emerged downstream. Although not hunted in a strict sense, the nearby Mandan secured bison, drowned by chance, when the ice broke. A trader observed the young men "in the drift ice leap from piece to piece, often falling between, plunging under, darting up elsewhere and securing themselves upon very slippery flakes" before they brought the carcasses to land. Religion also played a big role in Native American bison hunting. Plains Indians generally believed that successful hunts required certain rituals. The Omaha tribe had to approach a herd in four legs. At each stop the chiefs and the leader of the hunt would sit down and smoke and offer prayers for success. The Pawnee performed the purifying Big Washing Ceremony before each tribal summer hunt to avoid scaring the bison. To Plains Indians, the buffalo was one of the most sacred animal, and they felt obligated to treat them with verbal respect. When they were about to kill a buffalo, they would offer it a prayer. Failures in the hunt would often be attributed to poorly performed rituals. Each animal produced from 200 to 400 pounds of meat, so a slaughter of 50 animals produced far more food than could possibly be eaten by the band, a wastage that was often commented upon by European and American observers. Sometimes a herd would be killed just to get at the delicacies such as the fat-filled tongues. Bison that escaped the trap were hunted down and killed so they could not warn the other bison. Before the introduction of horses, bison were herded into large chutes made of rocks and willow branches and trapped in a corral called a buffalo pound and then slaughtered or stampeded over cliffs, called buffalo jumps. Both pound and jump archaeological sites are found in several places in the U.S. and Canada. In the case of a jump, large groups of people would herd the bison for several miles, forcing them into a stampede that drove the herd over a cliff. Horses taken from the Spanish were well-established in the nomadic hunting cultures by the early 1700s, and indigenous groups once living east of the Great Plains moved west to hunt the larger bison population. Intertribal warfare forced the Cheyennes to give up their cornfields at Biesterfeldt village and eventually cross west of the Missouri and become the well-known horseback buffalo hunters. In addition to using bison for themselves, these indigenous groups also traded meat and robes to village-based tribes. Lakota winter count of American Horse, 1817–1818. "The Oglalas had an abundance of buffalo meat and shared it with the Brulés, who were short of food". A bison skin on a frame designates plenty of meat. A good horseman could easily lance or shoot enough bison to keep his tribe and family fed, as long as a herd was nearby. The bison provided meat, leather, and sinew for bows. A fast hunting horse would usually be spared and first mounted near the bison. The hunter rode on a pack horse until then. Hunters with few horses ran besides the mount to the hunting grounds. Accidents, sometimes fatal, happened from time to time to both rider and horse. To avoid disputes, each hunter used arrows marked in a personal way. Lakota hunter Bear Face recognized his arrows by the one of three "arrow wings" made of a pelican feather. Castaneda wrote how it was possible to shoot an arrow right through a buffalo. The Pawnees had contests as to how many bison it was possible to kill with just one bowshot. The best result was three. An arrow stuck in the animal was preferred as the most lethal. It would inflict more damage with each jump and move. A white traveler credited the hunters with cutting up a bison and packing the meat on a horse in less than 15 minutes. When the bison stayed away and made hunting impossible, famine became a reality. The hard experience of starvation found way into stories and myths. A folk tale of the Kiowa begins "Famine once struck the Kiowa People ..." "The people were without food and no game could be found ..." makes an Omaha myth certain. A fur trader noted how some Sioux Indians were in want of meat at one time in 1804. Starving Yanktonais passed by Fort Clark in 1836. Already Castaneda noted the typical relations of two different plains people relying heavily on the same food source: "they ... are enemies of each other." The bison hunting resulted in loss of land for a number of Indian nations. Indirectly, it often disturbed the rhythm of a tribal life, caused economic losses and hardship, and damaged tribal autonomy. As long as bison hunting went on, intertribal warfare was omnipresent. The Kiowas have an early history in parts of present-day Montana and South Dakota. Here they fought the Cheyennes, "who challenged their right to hunt buffalo". Later, the Kiowas headed for the south together with the Comanche, when "the Lakota (Teton Sioux) drove them from the Black Hills territory". The Arapaho considered the Black Hills, South Dakota, their country. Knowing how the numerous Sioux entered the plains from the east during the 18th century and expanded westward, Chief Black Coal explained in 1875, "In the first place, they came from the Missouri River and reached this place, and now they have got up this far, and they claim all this land." The Brule Lakota turned south and "drove all the southern tribes from the best hunting grounds in the sandhill of Nebraska". Warriors guarded this new territory and other rich game land. In present-day Montana, the better-armed Blackfoot pushed the Kutenai, Flathead and Shoshone off the plains. In the start of the 19th century, they claimed the buffalo ranges entirely to the Rocky Mountains and fought all conceived as intruders. The less numerical tribe peoples west of the continental divide did not accept this. Their ancestors had hunted on the Great Plains and they would continue the tradition at all cost. "When we go to hunt Bison, we also prepare for war with the Peeagans [Piegan Blackfeet] and their allies", revealed a Flathead chief. A Kutenai gave this description of tribal hunts during buffalo days, "Across the mountains they went out on the prairie, but they were afraid of the Piegans." Ration Day at the Standing Rock Agency, 1883. The scarcity of buffalo led Plains Indians to become dependent on US government rations as source of food. Tribes forced away from the game rich areas had to try their luck on the edges of the best buffalo habitats. Small tribes found it hard to do even that. Due to attacks in the 1850s and 1860s, the village Indians of the Upper Missouri "hardly dared go into the plains to hunt buffalo". The Sioux would stay near Arikara villages "and keep the bison away, so they could sell meat and hides to the Arikaras". In 1866, the Pend d'Oreilles crossed the Rocky Mountain from the west, just to be attacked by Indian foes as they entered the plains. They lost 21 people. The beaten hunting party returned in a "horrible condition" and "all nearly famished". Often, the attackers tried to capture dried meat, equipment and horses during a fight. Lack of horses owing to raids reduced the chances for securing an ample amount of meat on the hunts. In 1860, the Ponca lost 100 horses, while the Mandan and Hidatsa saw the enemy disappear with 175 horses in a single raid in 1861. Conflicts between the bison hunting tribes ranged from raids to massacres. Camps were left without leaders. In the course of a battle, tipis and hides could be cut to pieces and tipi poles broken. Organized bison hunts and camp moves were stopped by the enemy, and village Indians had to flee their homes. Massacre Canyon battlefield (1873), Nebraska. Pawnee reservation and relevant Indian territories. The last major Indian-Indian battle was between two big hunting parties, Lakota and Pawnee. It cost the lives of a minimum of ten children, 20 men and 39 women from the Pawnee tribe, counting Chief Sky Chief. The battle was fought on U.S. ground more than 180 miles outside both Indian Reservations. Sioux Indians burned a village of Nuptadi Mandans in the last quarter of the 18th century. Other villages of the Mandan, Hidatsa and Arikara destroyed either completely or partially in Indian attacks are two Hidatsa villages in 1834, Mitutanka on January 9, 1839 and Like-a-Fishhook Village in 1862. The three tribes would routinely ask the U.S. army for assistance against stronger Indian powers until the end of intertribal warfare in the area. Eighteen out of 30 prominent Poncas were killed in a surprise attack in 1824, "including the famous Smoke-maker". At a stroke, the small tribe stood without any experienced leaders. In 1859, the Poncas lost two chiefs when a combined group of Indian enemies charged a hunting camp. Half a Pawnee village was set ablaze during a large-scale attack in 1843, and the Pawnee never rebuilt it. More than 60 inhabitants lost their lives, including Chief Blue Coat. The otherwise numerous Small Robes band of the Piegan Blackfoot lost influence and some self-reliance after a severe River Crow attack on a moving camp at "Mountains on Both Sides" (Judith Gap, Montana) in 1845. "Their days of greatness were over." In 1852, an Omaha delegation visited Washington, D.C. It would "request the federal government's protection". Five different Indian nations raided the Omaha. During bison days, spiritual leaders were killed, ceremonies disturbed and medicine bundles lost to the enemy. When the Nuptadi Mandan village was set ablaze around 1785, "the Old Woman Who Never Dies bundle-owner was killed defending his lodge and his bundles which were burned." This was a vital bundle to the corn growing Mandans, since it ensured rain and promised good crops. The turtle drums used in the Okipa ceremony (Sun Dance) were only saved because they suddenly produced water. During a large-scale attack on a Pawnee hunting camp in 1830, the Cheyennes lost their most sacred tribal bundle, the Mahuts. It contains four arrows with influence upon wars and bison hunts. The Cheyennes left the battlefield that moment and went back to their camp, mourning all the way. In the words of Sand Creek massacre survivor George Bent, the loss of the arrows "was the greatest disaster the Cheyennes ever suffered." A Kiowa calendar memorizes a summer incident in 1833 by the words "They Cut Off Their Heads". Osage Indians massacred an exposed Kiowa camp by killing and beheading many women, children and aged. The Osage also captured the Kiowa Sun Dance figure, so "no Sun Dance was held that summer". The Flatheads in the Bitterroot valley had asked for teachings from Jesuit priests since 1831. Ten years later, the construction of St. Mary's Mission was finally underway. The first communion was on Easter 1842. Attacks from Blackfoot war groups closed the mission in 1850, against the wishes of the local Flatheads. 1892: bison skulls await industrial processing at Michigan Carbon Works in Rogueville (a suburb of Detroit). Bones were processed to be used for glue, fertilizer, dye/tint/ink, or were burned to create "bone char" which was an important component for sugar refining. In the 16th century, North America contained 25–30 million buffalo. Bison were hunted almost to extinction in the 19th century. Less than 100 remained in the wild by the late 1880s. They were hunted for their skins and tongues with the rest of the animal left behind to decay on the ground. After the animals rotted, their bones were collected and shipped back east in large quantities. Due to the roaming behavior of bison, their mass destruction came with relative ease to hunters. When one bison in a herd is killed, the other bison gather around it. Due to this pattern, the ability of a hunter to kill one bison often led to the destruction of a large herd of them. Map of the extermination of the bison to 1889. This map based on William Temple Hornaday's late-19th century research. Thirty years ago millions of the great unwieldy animals existed on this continent. Innumerable droves roamed, comparatively undisturbed and unmolested ... Many thousands have been ruthlessly and shamefully slain every season for past twenty years or more by white hunters and tourists merely for their robes, and in sheer wanton sport, and their huge carcasses left to fester and rot, and their bleached skeletons to strew the deserts and lonely plains. The cause of this buffalo population crash is heavily debated by academics. Because native people adapted to the social changes that resulted from Euro-American arrival in the West, some native people reinvented their style of hunting and thus drove the buffalo population down. Proponents of this view argue that some native people embraced the fur trade and adapted to bison hunting via horse, which drove up significantly the number of bison they could slaughter. Rath & Wright's buffalo hide yard in Dodge City, Kansas, showing 40,000 buffalo hides. Commercial bison hunters also emerged at this time. Military forts often supported hunters, who would use their civilian sources near their military base. Though officers hunted bison for food and sport, professional hunters made a far larger impact in the decline of bison population. Officers stationed in Fort Hays and Wallace even had bets in their "buffalo shooting championship of the world", between "Medicine Bill" Comstock and "Buffalo Bill" Cody. Some of these hunters would engage in mass bison slaughter in order to make a living. The US Army sanctioned and actively endorsed the wholesale slaughter of bison herds. The federal government promoted bison hunting for various reasons, to allow ranchers to range their cattle without competition from other bovines, and primarily to weaken the North American Indian population by removing their main food source and to pressure them onto the Indian reservations during times of conflict. Without the bison, native people of the plains were often forced to leave the land or starve to death. One of the biggest advocates of this strategy was General William Tecumseh Sherman. On June 26, 1869, the Army Navy Journal reported: "General Sherman remarked, in conversation the other day, that the quickest way to compel the Indians to settle down to civilized life was to send ten regiments of soldiers to the plains, with orders to shoot buffaloes until they became too scarce to support the redskins." However, it has been argued, "While there is ample evidence that this belief was shared by some of the army leadership ... there is little evidence that it was directly acted upon in any significant way." According to Professor David Smits: "Frustrated bluecoats, unable to deliver a punishing blow to the so-called 'Hostiles', unless they were immobilized in their winter camps, could, however, strike at a more accessible target, namely, the buffalo. That tactic also made curious sense, for in soldiers' minds the buffalo and the Plains Indian were virtually inseparable." According to historian Pekka Hämäläinen, a few Native American tribes also partly contributed to the collapse of the bison in the southern Plains. By the 1830s the Comanche and their allies on the southern plains were killing about 280,000 bison a year, which was near the limit of sustainability for that region. Firearms and horses, along with a growing export market for buffalo robes and bison meat had resulted in larger and larger numbers of bison killed each year. A long and intense drought hit the southern plains in 1845, lasting into the 1860s, which caused a widespread collapse of the bison herds. In the 1860s, the rains returned and the bison herds recovered to a degree. After the Pacific Railway Act of 1862, the west experienced a large boom in colonist population—and a large decline in bison population. As railways expanded, military troops and supplies were able to be transported more efficiently to the Plains region. Some railroads even hired commercial hunters to feed their laborers. William Frederick "Buffalo Bill" Cody, for example, was hired by the Kansas Pacific Railroad for this reason. Hunters began arriving in masses, and trains would often slow down on their routes to allow for raised hunting. Men would either climb aboard the roofs of trains or fire shots at herds from outside their windows. As a description of this from Harper's Weekly noted: "The train is 'slowed' to a rate of speed about equal to that of the herd; the passengers get out fire-arms which are provided for the defense of the train against the Indians, and open from the windows and platforms of the cars a fire that resembles a brisk skirmish." The railroad industry also wanted bison herds culled or eliminated. Herds of bison on tracks could damage locomotives when the trains failed to stop in time. Herds often took shelter in the artificial cuts formed by the grade of the track winding through hills and mountains in harsh winter conditions. As a result, bison herds could delay a train for days. The main reason for the bison's near-demise, much like the actual demise of the Passenger Pigeon, was commercial hunting. Bison skins were used for industrial machine belts, clothing such as robes, and rugs. There was a huge export trade to Europe of bison hides. Old West bison hunting was very often a big commercial enterprise, involving organized teams of one or two professional hunters, backed by a team of skinners, gun cleaners, cartridge reloaders, cooks, wranglers, blacksmiths, security guards, teamsters, and numerous horses and wagons. Men were even employed to recover and recast lead bullets taken from the carcasses. Many of these professional hunters, such as Buffalo Bill Cody, killed over a hundred animals at a single stand and many thousands in their career. One professional hunter killed over 20,000 by his own count. A good hide could bring $3 in Dodge City, Kansas, and a very good one (the heavy winter coat) could sell for $50 in an era when a laborer would be lucky to make a dollar a day. The hunter would customarily locate the herd in the early morning, and station himself about 100 yards/meters from it, shooting the animals broadside through the lungs. Head shots were not preferred as the soft lead bullets would often flatten and fail to penetrate the skull, especially if mud was matted on the head of the animal. The bison would continue to drop until either the herd sensed danger and stampeded or perhaps a wounded animal attacked another, causing the herd to disperse. If done properly a large number of bison would be felled at one time. Following up were the skinners, who would drive a spike through the nose of each dead animal with a sledgehammer, hook up a horse team, and pull the hide from the carcass. The hides were dressed, prepared, and stacked on the wagons by other members of the organization. For a decade after 1873, there were several hundred, perhaps over a thousand, such commercial hide hunting outfits harvesting bison at any one time, vastly exceeding the take by American Indians or individual meat hunters. The commercial take arguably was anywhere from 2,000 to 100,000 animals per day depending on the season, though there are no statistics available. It was said that the Big .50s were fired so much that hunters needed at least two rifles to let the barrels cool off; The Fireside Book of Guns reports they were sometimes quenched in the winter snow. Dodge City saw railroad cars sent East filled with stacked hides. The building of the railroads through Colorado and Kansas split the bison herd in two parts, the southern herd and the northern herd. The last refuge of the southern herd was in the Texas Panhandle. As the great herds began to wane, proposals to protect the bison were discussed. In some cases, individual military officers attempted to end the mass slaughter of these buffalo. William F. "Buffalo Bill" Cody, among others, spoke in favor of protecting the bison because he saw that the pressure on the species was too great. Yet these proposals were discouraged since it was recognized that the Plains Indians, some of the tribes often at war with the United States, depended on bison for their way of life. (Other buffalo hunting tribes cannot tell of a single fight with the United States, namely tribes like the Assiniboine, the Hidatsa, the Gros Ventre, the Ponca and the Omaha). In 1874, President Ulysses S. Grant "pocket vetoed" a Federal bill to protect the dwindling bison herds, and in 1875 General Philip Sheridan pleaded to a joint session of Congress to slaughter the herds, to deprive the Indians of their source of food. By 1884, the American Bison was close to extinction. 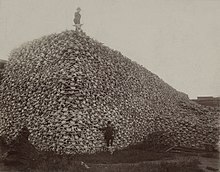 Subsequent settlers harvested bison bones to be sold for fertilizer. It was an important source of supplemental income for poorer farmers in the 1880s and early 1890s. The last tribal hunt of the Omaha, December 1876 to March 1877. After more than 30 camp moves, the hunters finally found a herd 400 miles outside the Omaha Reservation (Nebraska). In 1912, Gilmore secured the account of the hunting expedition into Kansas from Francis La Flesche. La Flesche was one of the Omaha scouts looking for game. (Route approximately). During the 1870s and 1880s, more and more tribes went on their last great bison hunt. Led by Chief Washakie, around 1,800 Shoshones in the Wind River Indian Reservation in Wyoming started out in October 1874. Going north, the men, women and children crossed the border of the reservation. Scouts came back with news of buffalo near Gooseberry Creek. The hunters got around 125 bison. Fewer hunters left the reservation the next two years and those who went focused on elk, deer and other game. The final hunt of the Omaha Indians in Nebraska took place in December 1876. Indian agents, with insufficient funds, accepted long hunting expeditions of the Flathead and Pend d'Oreille to the plains in the late 1870s. In the early 1880s, the buffalo were gone. Gros Ventre Indians left the Fort Belknap Indian Reservation in Montana for a hunt north of Milk River in 1877. Chief Jerry Running Fisher enlisted as scout at Fort Assinniboine in 1881. "His camp stayed close to the troops when they patrolled, so they hunted undisturbed by enemy tribes." Two years later, the buffalo were all but gone. In June 1882, more than 600 Lakota and Yanktonai hunters located a big herd on the plains far west of the Standing Rock Agency. In this last hunt, they got around 5,000 animals. Following the Civil War, the U.S. had ratified roughly 400 treaties with the Plains Indians, but went on to break many of these as the Westward Movement ensued. The bison population crash represented a loss of spirit, land, and autonomy for most Indigenous People at this time. Much of the land delegated to Indigenous tribes during this westward expansion were barren tracts of land, far from any buffalo herds. These reservations were not sustainable for Natives, who relied on bison for food. One of these reservations was the Sand Creek Reservation in southeastern Colorado. The nearest buffalo herd was over two hundred miles away, and many Cheyennes began leaving the reservation, forced to hunt livestock of nearby settlers and passing wagon trains. Plains Indians adopted a nomadic lifestyle, one which depended on bison location for their food source. Bison is high in protein levels and low in fat content, and contributed to the wholesome diet of Native Americans. Additionally, they used every edible part of the bison—organs, brains, fetuses, and placental membranes included. The U.S. military strategically exterminated bison in masses for this reason; by ridding the Plains Indians of their primary food source, they would become further dependent on reservations for subsistence. Bison meat also supplemented the army rations, and commanders issued hunting passes freely to their troops to obtain fresh meat. Oftentimes military men would kill the bison and not take any of the meat from it. As Kiowa chief Santanta complained at the Medicine Lodge Treaty Council of 1867: "has the white man become a child, that he should recklessly kill and not eat? When the red men slay game, they do so that they may live and not starve." By 1893, fewer than 400 wild bison were left—and Native Americans were pushed to reservations, relying on farming and waiting on scanty government rations for food. As a consequence of the great bison slaughter, Indians became more heavily dependent on the U.S. Government and American traders for their needs. Many military men recognized the bison slaughter as a way of reducing the autonomy of Indigenous Peoples. For instance, Lieutenant Colonel Dodge, a high-ranking military officer, once said in a conversation with Frank H. Mayer: "Mayer, there's no two ways about it, either the buffalo or the Indian must go. Only when the Indian becomes absolutely dependent on us for his every need, will we be able to handle him. He's too independent with the buffalo. But if we kill the buffalo we conquer the Indian. It seems a more humane thing to kill the buffalo than the Indian, so the buffalo must go." Even Richard Henry Pratt, founder of the Carlisle Indian School and a Tenth Cavalry lieutenant in the Red River War, discussed this strategy after his retirement: "the generation of the buffalo was ordered as a military measure because it was plain that the Indians could not be controlled on their reservations as long as their greatest resource, the buffalo, were so plentiful." The destruction of bison signaled the end of the Indian Wars, and consequently their movement towards reservations. When the Texas legislature proposed a bill to protect the bison, General Sheridan disapproved of it, stating, "These men have done more in the last two years, and will do more in the next year, to settle the vexed Indian question, than the entire regular army has done in the last forty years. They are destroying the Indians' commissary. And it is a well known fact that an army losing its base of supplies is placed at a great disadvantage. Send them powder and lead, if you will; but for a lasting peace, let them kill, skin and sell until the buffaloes are exterminated. Then your prairies can be covered with speckled cattle." Though buffalo were being slaughtered in masses, many Indians perceived the buffalo as part of the natural world—something guaranteed to them by the Creator. In fact, for some Plains indigenous peoples, buffalo are known as the first people. Many Indians did not grasp the concept of species extinction. Thus, when the buffalo began to disappear in great numbers, it was particularly harrowing to the Indians. As Crow Chief Plenty Coups described it: "When the buffalo went away the hearts of my people fell to the ground, and they could not lift them up again. After this nothing happened. There was little singing anywhere." Spiritual loss was rampant; buffalo were an integral part of Indian society and they would frequently take part in ceremonies for each buffalo they killed to honor its sacrifice. In order to boost morale during this time, Sioux Indians and other tribes took part in the Ghost Dance, which consisted of hundreds of people dancing until 100 persons were lying unconscious. Native Americans served as the caretakers of bison, so their forced movement towards bison-free reservation areas was particularly challenging. Upon their arrival to reservations, some tribes asked the Government officials if they could hunt cattle the way they hunted buffalo. During these cattle hunts, Plains Indians would dress up in their finery, sing bison songs, and attempt to simulate a bison hunt. These cattle hunts served as a way for the Plains Indians to preserve their ceremonies, community, and morale. However, the U.S. government soon put a halt to cattle hunts, choosing to package the beef up for the Native Americans instead. The mass buffalo slaughter also seriously harmed the ecological health of the Great Plains region, in which many Indigenous People lived. Unlike cattle, bison were naturally fit to thrive in the Great Plains environment; bisons' giant heads are naturally fit to drive through snow and make them far more likely to survive harsh winters. Additionally, bison grazing helps to cultivate the prairie, making it ripe for hosting a diverse range of plants. Cattle, on the other hand, eat through vegetation and limit the ecosystem's ability to support a diverse range of species. Agricultural and residential development of the prairie is estimated to have reduced the prairie to 0.1% of its former area. The plains region has lost nearly one-third of its prime topsoil since the onset of the buffalo slaughter. Cattle are also causing water to be pillaged at rates that are depleting many aquifers of their resources. Research also suggests that the absence of native grasses leads to topsoil erosion—a main contributor of the dust bowl and black blizzards of the 1930s. Crow woman Pretty Shield found something good in the new situation, namely the end of the intertribal wars. She had been raised by a mourning aunt, who had lost her man and two small girls in intertribal conflicts. Repeatedly, sorrow darkened the life of Crow camps after Indian-Indian battles. "Always there was some man missing ... And then there were the orphans that war made ... I am glad that war has gone forever. It was no good - no good!" William Temple Hornaday of the New York Zoological Park's "The Extermination of the American Bison" (1887) predicted that bison would be extinct within two decades. Hornaday founded the American Bison Society in 1905, supported by Theodore Roosevelt, to found, stock, and protect bison sanctuaries. The famous herd of James "Scotty" Philip in South Dakota was one of the earliest reintroductions of bison to North America. In 1899, Phillip purchased a small herd (five of them, including the female) from Dug Carlin, Pete Dupree's brother-in-law, whose son Fred had roped five calves in the Last Big Buffalo Hunt on the Grand River in 1881 and taken them back home to the ranch on the Cheyenne River. Scotty's goal was to preserve the animal from extinction. At the time of his death in 1911 at 53, Philip had grown the herd to an estimated 1,000 to 1,200 head of bison. A variety of privately owned herds had also been established, starting from this population. In 1873, Samuel Walking Coyote, a Pend d'orville Indian, herded seven orphan calves along the Flathead Reservation west of the Rocky Mountain divide. In 1899, he sold 13 of these bison to ranchers Charles Allard and Michel Pablo for $2,000 in gold. Michel Pablo and Charles Allard spent more than 20 years assembling one of the largest collections of purebred bison on the continent (by the time of Allard's death in 1896, the herd numbered 300). In 1907, after U.S. authorities declined to buy the herd, Pablo struck a deal with the Canadian government and shipped most of his bison northward to the newly created Elk Island National Park. Also, in 1907, the New York Zoological Park sent 15 bison to Wichita Mountains Wildlife Refuge in Oklahoma forming the nucleus of a herd that now numbers 650. The Yellowstone Park Bison Herd formed naturally from a few bison that remained in the Yellowstone Park area after the great slaughter at the end of the 19th century. Yellowstone National Park is one of the very few areas where wild bison were never completely extirpated. It is the only continuously wild bison herd in the United States. Numbering between 3,000 and 3,500, the Yellowstone Park bison herd is descended from a remnant population of 23 individual bison that survived the mass slaughter of the 19th century by hiding out in the Pelican Valley of Yellowstone Park. In 1902, a captive herd of 21 plains bison was introduced to the Lamar Valley in Yellowstone and managed as livestock until the 1960s, when a policy of natural regulation was adopted by the park. Many of the national parks, in particular the Yellowstone National Park, are a direct result of the guilt that many felt regarding the buffalo slaughter of the Great Plains. The Antelope Island bison herd is an isolated bison herd on Utah's Antelope Island, and was founded from 12 animals that came from a private ranch in Texas in the late 1800s. The Antelope Island bison herd fluctuates between 550 and 700, and is one of the largest publicly owned bison herds in the nation. The herd contains some unique genetic traits and has been used to improve the genetic diversity of American bison, however, as is the case with most bison herds, some genes from domestic cattle have been found in the Antelope Island Bison Herd. The last of the remaining "southern herd" in Texas were saved before extinction in 1876. Charles Goodnight's wife Molly encouraged him to save some of the last relict bison that had taken refuge in the Texas Panhandle. Extremely committed to save this herd, she went as far as to rescue some young orphaned buffaloes and even bottle fed and cared for them until adulthood. By saving these few plains bison, she was able to establish an impressive buffalo herd near the Palo Duro Canyon. Peaking at 250 in 1933, the last of the southern buffalo would become known as the Goodnight herd. The descendants of this southern herd were moved to Caprock Canyons State Park near Quitaque, Texas, in 1998. 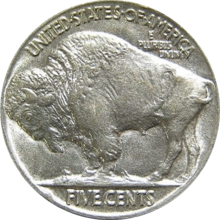 The reverse of the buffalo nickel paid numismatic tribute, starting in 1913, to the American bison and its rescue from extinction. Many other bison herds are in the process of being created or have been created in state parks and national parks, and on private ranches, with individuals taken from the existing main 'foundation herds'. An example is the Henry Mountains bison herd in Central Utah which was founded in 1941 with bison that were relocated from Yellowstone National Park. This herd now numbers approximately 400 individuals and in the last decade steps have been taken to expand this herd to the mountains of the Book Cliffs, also in Utah. One of the largest privately owned herds, numbering 2,500, in the US is on the Tallgrass Prairie Preserve in Oklahoma which is owned by the Nature Conservancy. Ted Turner is the largest private owner of bison with about 50,000 on several different ranches. The current American bison population has been growing rapidly, and is estimated at 350,000 compared to an estimated 60 to 100 million in the mid-19th century. Most current herds, however are genetically polluted or partly crossbred with cattle. Today there are only four genetically unmixed, free roaming, public bison herds and only two that are also free of brucellosis: the Henry Mountains Bison Herd and the Wind Cave Bison Herd. A founder population of 16 animals from the Wind Cave bison herd was re-established in Montana in 2005 by the American Prairie Foundation. The herd now numbers near 100 and roams a 14,000-acre (57 km2) grassland expanse on American Prairie Reserve. The end of the ranching era and the onset of the natural regulation era set into motion a chain of events that have led to the bison of Yellowstone Park migrating to lower elevations outside the park in search of winter forage. The presence of wild bison in Montana is perceived as a threat to many cattle ranchers, who fear that the small percentage of bison that carry brucellosis will infect livestock and cause cows to abort their first calves. However, there has never been a documented case of brucellosis being transmitted to cattle from wild bison. The management controversy that began in the early 1980s continues to this day, with advocacy groups arguing that the herd should be protected as a distinct population segment under the Endangered Species Act. Many conservation measures have been taken by American Indian Nations in order to preserve and grow the bison population as well. Of these Native conservation efforts, the Inter Tribal Bison Council is one of the most significant. It was formed in 1990, composed of 56 tribes in 19 states. These tribes represent a collective herd of more than 15,000 bison and focus on reestablishing herds on Indian lands in order to promote culture, revitalize spiritual solidarity, and restore the ecosystem. Some Inter Tribal Bison Council members argue that the bison's economic value is one of the main factors driving its resurgence. Bison serve as a low cost substitute for cattle, and can withstand the winters in the Plains region far easier than cattle. A recent Native American conservation effort that has been gaining ground is the Buffalo Field Campaign. Founded in 1996 by Mike Mease, Sicango Lakota, and Rosalie Little Thunder, the Buffalo Field Campaign hopes to get bison migrating freely in Montana and beyond. The Buffalo Field Campaign challenges Montana's DOL officials, who slaughtered 1631 bison in the winter of 2007-2008 in a search for food away from Yellowstone National Park. Founder Mike Mease commented in regards to DOL officials: "It's disheartening what they're doing to buffalo. It's marked with prejudice that exists from way back. I think the whole problem with white society is there's this fear of anything wild. They're so scared of anything they can't control, whereas the First Nations take pride in being part of it and protecting the wild because of its importance. Our culture is so far removed from that, and afraid of it." Additionally, many smaller tribal groups aim to reintroduce bison to their native lands. The Ponca Tribe of Nebraska, which was restored in 1990, has a herd of roughly 100 bison in two pastures. Similarly, the Southern Ute Tribe in Colorado has raised nearly 30 bison in a 350-acre fenced pasture. According to Rutgers University Professor Frank Popper, bison restoration brings better meat and ecological health to the plains region, in addition to restoring bison-Native American relations. However, there is a considerable risk involved with restoring the bison population: brucellosis. If bison are introduced in large numbers, the risk of brucellosis is high. For some spokesmen, the resurgence of the bison population reflects a cultural and spiritual recovery from the effects of bison hunting in mid-1800s. By creating groups such as the Inter-Tribal Bison Cooperative and the Buffalo Field Campaign, Native Americans are hoping to not only restore the bison population but also improve solidarity and morale among their tribes. "We recognize the bison as a symbol of strength in unity," stated Fred Dubray, former president of the Inter-Tribal Bison Cooperative. "We believe that reintroduction of the buffalo to tribal lands will help heal the spirit of both the Indian people and the buffalo. To reestablish healthy buffalo populations is to reestablish hope for Indian people." Hunting of wild bison is legal in some states and provinces where public herds require culling to maintain a target population. In Alberta, where one of only two continuously wild herds of bison exist in North America at Wood Buffalo National Park, bison are hunted to protect disease-free public (reintroduced) and private herds of bison. In Montana, a public hunt was reestablished in 2005, with 50 permits being issued. The Montana Fish, Wildlife, and Parks Commission increased the number of tags to 140 for the 2006/2007 season. Advocacy groups claim that it is premature to reestablish the hunt, given the bison's lack of habitat and wildlife status in Montana. Though the number is usually several hundred, up to more than a thousand bison from the Yellowstone Park Bison Herd have been killed in some years when they wander north from the Lamar Valley of Yellowstone National Park into private and state lands of Montana. This hunting is done because of fears that the Yellowstone bison, which are often infected with Brucellosis will spread that disease to local domestic cattle.To date no credible instance of bison to cattle transmission has ever been established, recorded or proven although there is some evidence of transmission between wild caribou and bison. The State of Utah maintains two bison herds. Bison hunting in Utah is permitted in both the Antelope Island bison herd and the Henry Mountains bison herd though the licenses are limited and tightly controlled. A Game Ranger is also generally sent out with any hunters to help them find and select the right bison to kill. In this way, the hunting is used as a part of the wildlife management strategy and to help cull less desirable individuals. Every year all the bison in the Antelope Island bison herd are rounded up to be examined and vaccinated. Then most of them are turned loose again, to wander Antelope Island but approximately 100 bison are sold at an auction, and hunters are allowed to kill a half dozen bison. This hunting takes place on Antelope Island in December each year. Fees from the hunters are used to improve Antelope Island State Park and to help maintain the bison herd. Hunting is also allowed every year in the Henry Mountains bison herd in Utah. The Henry Mountains herd has sometimes numbered up to 500 individuals but the Utah Division of Wildlife Resources has determined that the carrying capacity for the Henry Mountains bison herd is 325 individuals. Some of the extra individuals have been transplanted, but most of them are not transplanted or sold, so hunting is the major tool used to control their population. "In 2009, 146 public once-in-a-lifetime Henry Mountain bison hunting permits were issued." Most years, 50 to 100 licenses are issued to hunt bison in the Henry Mountains. Bison were also reintroduced to Alaska in 1928, and both domestic and wild herds subsist in a few parts of the state. The state grants limited permits to hunt wild bison each year. In 2001 the United States government donated some buffalo calves from South Dakota and Colorado to the Mexican government for the reintroduction of bison to Mexico's nature reserves. These reserves included El Uno Ranch at Janos and Santa Elena Canyon, Chihuahua, and Boquillas del Carmen, Coahuila, which are located on the southern shore of the Rio Grande and the grasslands bordering Texas and New Mexico. Wikimedia Commons has media related to Buffalo hunting. ^ Farr, William E. (Winter 2003): "Going to Buffalo. Indian Hunting Migrations across the Rocky Mountains. Part 1." Montana, the Magazine of Western History, Vol. 53, No. 4, pp. 2-21. ^ Farr, William E. (Spring 2004): "Going to Buffalo. Indian Hunting Migrations across the Rocky Mountains. Part 2." Montana, the Magazine of Western History, Vol. 54, No. 1, pp. 26-43. ^ Castaneda, Pedro (1966): The Journey of Coronado. Ann Arbor, p. 205. ^ Rostlund, Erhard (December 1, 1960). "# The Geographic Range of the Historic Bison in the Southeast". Annals of the Association of American Geographers. 50 (4): 395–407. doi:10.1111/j.1467-8306.1960.tb00357.x. ISSN 0004-5608. JSTOR 2561275. ^ Juras, Philip (1997). "The Presettlement Piedmont Savanna: A Model For Landscape Design and Management". Archived from the original on June 17, 2008. Retrieved July 21, 2008. ^ Means, Russell; Johnson, Bayard (1939–2012). If you've forgotten the names of the clouds, you've lost your way: an introduction to American Indian thought & philosophy. Porcupine, South Dakota. ISBN 978-1482068108. OCLC 848321529. ^ Ewers, John C. (1988): "The last Bison Drive of the Blackfoot Indians". Indian Life On The Upper Missouri. Norman and London, pp. 157–168. ^ Castaneda, Pedro (1966): The Journey of Coronado. Ann Arbor, p. 112. ^ Medicine Crow, Joseph (1992): From the Heart of the Crow Country. The Crow Indians' Own Stories. New York, pp. 86–99. ^ Lowie, Robert H. (1983): The Crow Indians. Lincoln and London, p. 73. ^ Kelsey, Henry (1929): The Kelsey Papers. Ottawa, p. 13. ^ Ewers, John C. (1988): "A Blood Indian's Conception of Tribal Life in Dog Days". Indian Life On The Upper Missouri. Norman and London, p. 9. ^ Wood, Raymond W. and Thomas D. Thiessen (1987): Early Fur Trade On The Northern Plains. Canadian Traders Among the Mandan and Hidatsa Indians, 1738–1818. Norman and London, p. 265. ^ Wood, Raymond W. and Thomas D. Thiessen (1987): Early Fur Trade On The Northern Plains. Canadian Traders Among the Mandan and Hidatsa Indians, 1738–1818. Norman and London, p. 239. ^ a b Fletcher, Alice C. and F. La Flesche (1992): The Omaha Tribe. Lincoln and London, p. 281. ^ Murie, James R. (1981): "Ceremonies of the Pawnee. Part I: The Skiri Smithsonian Contributions to Anthropology, No. 27, p. 98. ^ Krech III, Shepard. "Buffalo Tales: The Near-Extermination of the American Bison". National Humanities Center. Brown University. Retrieved April 13, 2015. ^ Hyde, George E. (1987): Life of George Bent. Written From His Letters. Norman, p. 12. ^ Lueck, Dean (June 2002). "The Extermination and Conservation of the American Bison". Journal of Legal Studies. 31 (2): 609–652. doi:10.1086/340410. JSTOR 10.1086/340410. ^ Mallory, Gerrick (1886): "The Corbusier Winter Counts Smithsonian Institution. 4th Annual Report of the Bureau of Ethnology, 1882–83. Washington, p. 136. ^ Nabokov, Peter (1982): Two Leggings. The Making of a Crow Warrior. Lincoln and London, p. 158. ^ Murray, Charles A. (1974): Travels in North America. Vol. I. New York, p. 386. ^ Chardon, F. A. (1997): Chardon's Journal at Fort Clark, 1834–1839. Lincoln and London, p. 159. ^ Boyd, Maurice (1981): Kiowa Voices. Ceremonial Dance, Ritual and Song. Part I. Fort Worth, p. 15. ^ Hyde, George E. (1987): Life of George Bent. Written From His Letters. Norman, p. 200. ^ Walker, James R. (1982): Lakota Society. Lincoln and London, p. 40. ^ Fletcher, Alice C. and F. La Flesche (1992): The Omaha Tribe. Lincoln and London, p. 272. ^ Densmore, Frances (1918): Teton Sioux Music. Smithsonian Institution. Bureau of American Ethnology. Bulletin 61. Washington, p. 439. ^ Castaneda, Pedro (1966): The Journey of Coronado. Ann Arbor, p. 71. ^ Blaine, Martha R. (1990): Pawnee Passage, 1870–1875. Norman and London, p. 81. ^ Walker, James R. (1982): Lakota Society. Lincoln and London, p. 80. ^ Murray, Charles A. (1974): Travels in North America. Vol. I. New York, p. 297. ^ Boyd, Maurice (1983): Kiowa Voices. Myth, Legends and Folktales. Part II. Fort Worth, p. 127. ^ Fletcher, Alice C. and F. La Flesche (1992): The Omaha Tribe. Lincoln and London, p. 148. ^ Tabeau, Pierre-Antoine (1968): Tabeau's Narrative of Loisel's Expedition to the Upper Missouri. Norman, p. 72. ^ Chardon, F. A. (1997): Chardon's Journal At Fort Clark, 1834–1839. Lincoln and London, p. 52. ^ Castaneda, Pedro (1966): The Journey of Coronado. Ann Arbor, p. 210. ^ McGinnis, Anthony (1990): Counting Coup and Cutting Horses. Evergreen. ^ Ewers, John C. (Oct. 1975): "Intertribal Warfare as a Precursor of Indian-White Warfare on the Northern Great Plains". Western Historical Quarterly, Vol. 6, No. 4, pp. 397-410. ^ Boyd, Maurice (1983): Kiowa Voices. Myth, Legends and Folktales. Part II. Fort Worth, p. 79. ^ Boyd, Maurice (1983): Kiowa Voices. Myth, Legends and Folktales. Part II. Fort Worth, p. xxvi. ^ Bass, Althea (1966): The Arapaho Way. A Memoir of an Indian Boyhood. New York, p. 11. ^ Anderson, Jeffrey D. (2003): One Hundred Years of Old Man Sage. An Arapaho Life. Lincoln and London, p. 72. ^ Fowler, Loretta (1982): Arapahoe Politics, 1851–1978. Symbols in Crises of Authority. Lincoln and London, p. 56. ^ Bettelyoun, Susan Bordeaux and Josephine Waggoner (1998): With My Own Eyes. A Lakota Woman Tells Her People's Own History. Lincoln and London, p. 17. ^ Densmore, Frances (1918): Teton Sioux Music. Smithsonian Institution. Bureau of American Ethnology. Bulletin 61. Washington, p. 134. ^ Calloway, Colin G. (April 1982): "The Inter-tribal Balance of Power on the Great Plains, 1760–1850". The Journal of American Studies, Vol. 16., No. 1, pp. 25–47, p. 40. ^ Farr, William E. (Winter 2003): "Going to Buffalo. Indian Hunting Migrations across the Rocky Mountains. Part 1". Montana, the Magazine of Western History, Vol. 53, No. 4, pp. 2–21, p. 6. ^ Boas, Franz (1918): Kutenai Tales. Smithsonian Institution. Bureau of American Ethnology. Bulletin 59. Washington, p. 53. ^ Hyde, George E. (1987): Life of George Bent. Written From His Letters. Norman, p. 16. ^ Meyer, Roy W. (1977): The Village Indians of the Upper Missouri. The Mandans, Hidatsas, and Arikaras. Lincoln and London, p. 40. ^ U.S. Serial Set 1284, 39th Congress, 2nd Session, Vol. 2, House Executive Document No. 1, p. 315. ^ McGinnis, Anthony (1990): Counting Coup and Cutting Horses. Evergreen, p. 122. ^ Howard, James H. (1965): The Ponca Tribe. Smithsonian Institution. Bureau of American Ethnology. Bulletin 195. Washington, p. 30. ^ McGinnis, Anthony (1990): Counting Coup and Cutting Horses. Evergreen, p. 97. ^ Meyer, Roy W. (1977): The Village Indians of the Upper Missouri. The Mandans, Hidatsas, and Arikaras. Lincoln and London, p. 108. ^ a b Hyde, George E. (1987): Life of George Bent. Written From His Letters. Norman, p. 26. ^ Boller, Henry A. (1966): "Henry A. Boller: Upper Missouri River Fur Trader". North Dakota History, Vol. 33, pp. 106–219, 204. ^ Bowers, Alfred W. (1991): Mandan Social and Ceremonial Organization. Moscow, p. 177. ^ Blaine, Garland James an Martha Royce Blaine (1977): "Pa-Re-Su A-Ri-Ra-Ke: The Hunters that were Massacred". Nebraska History, Vol. 58, No. 3, pp. 342-358. ^ Standing Bear, Luther (1975): My People, the Sioux. Lincoln, pp. 53–55. ^ a b Bowers, Alfred W. (1991): Mandan Social and Ceremonial Organization. Moscow, p. 360. ^ Stewart, Frank H. (Nov. 1974): "Mandan and Hidatsa Villages in the Eighteenth and Nineteenth Centuries". Plains Anthropologist, Vol. 19, pp. 287–302, p. 296. ^ Meyer, Roy W. (1977): The Village Indians of the Upper Missouri. The Mandans, Hidatsas, and Arikaras. Lincoln and London, p. 97. ^ Meyer, Roy W. (1977): The Village Indians of the Upper Missouri. The Mandans, Hidatsas, and Arikaras. Lincoln and London, p. 119. ^ Meyer, Roy W. (1977): The Village Indians of the Upper Missouri. The Mandans, Hidatsas, and Arikaras. Lincoln and London, pp. 105–106. ^ Howard, James H. (1965): The Ponca Tribe. Smithsonian Institution. Bureau of American Ethnology. Bulletin 195. Washington, p. 27. ^ Howard, James H. (1965): The Ponca Tribe. Smithsonian Institution. Bureau of American Ethnology. Bulletin 195. Washington, p. 31. ^ Jensen, Richard E. (Winter 1994): "The Pawnee Mission, 1834-1846". Nebraska History, Vol. 75, No. 4, pp. 301–310, p. 307. ^ Bedford, Denton R. (1975): "The Fight at "Mountains on Both Sides". The Indian Historian, Vol. 8. No. 2, pp. 13–23, p. 22. ^ Scherer, Joanna Cohan (Fall 1997): "The 1852 Omaha Indian Delegation Daguerreotypes. A Preponderance of Evidence". Nebraska History Vol. 78, No. 3, pp. 116–121. p. 118. ^ Bowers, Alfred W. (1991): Mandan Social and Ceremonial Organization. Moscow, p. 191. ^ Bowers, Alfred W. (1991): Mandan Social and Ceremonial Organization. Moscow, p. 108. ^ Hyde, George E. (1987): Life of George Bent. Written From His Letters. Norman, p. 51. ^ Boyd, Maurice (1981): Kiowa Voices. Ceremonial Dance, Ritual and Song. Part I. Fort Worth, p. 33. ^ Baumler, Ellen (Spring 2016): "A Cross in the Wilderness. St. Mary's Mission Celebrates 175 Years". Montana, The Magazine of Western History. Vol 66, No. 1, pp. 18–38, p. 26. ^ Peterson, Jacqueline and Laura Peers (1993): Sacred Encounters. Father De Smet and the Indians of the Rocky Mountain West. Norman and London, p. 98. ^ a b c Taylor, Scott (2011). "Buffalo Hunt: International Trade and the Virtual Extinction of the North American Bison". American Economic Review. 101 (7): 3162–3195. doi:10.1257/aer.101.7.3162. ^ a b Records, Laban (March 1995). Cherokee Outlet Cowboy: Recollectioons of Laban S. Records. Norman, Oklahoma: University of Oklahoma Press. ISBN 978-0-8061-2694-4. ^ Wheeler, Homer (1925). Forty Years in the Old West: the Personal Narrative of a Cattleman Indian Fighter, and Army Officer. The Bobbs-Merrill Company. p. 82. OCLC 1112113. Retrieved April 12, 2015. ^ "In the Prime of the Buffalo". Overland Monthly and Out West Magazine. 14 (83): 515. November 1889. ^ Isenberg, Andrew (2000). The Destruction of the Bison. An Environmental History 1750–1920 (PDF). Cambridge University Press. p. 193. ISBN 978-0521771726. ^ "American Buffalo: Spirit of a Nation". NPT. PBS. November 10, 1998. Retrieved April 7, 2015. ^ a b Smits, David (Autumn 1994). "The Frontier Army and the Destruction of the Buffalo: 1865–1883" (PDF). The Western Historical Quarterly. 25 (3): 312–338. doi:10.2307/971110. JSTOR 971110. Retrieved March 30, 2015. ^ a b Wooster, Robert (1988). "The Military and United States Indian Policy 1865-1903". ICE Case Studies: The Buffalo Harvest. Yale University Press. Retrieved April 12, 2015. ^ Hanson, Emma I. Memory and Vision: Arts, Cultures, and Lives of Plains Indian People. Cody, WY: Buffalo Bill Historical Center, 2007: 211. ^ Moulton, M (1995). Wildlife issues in a changing world, 2nd edition. CRC Press. ^ a b c Smits, David (September 1994). "The Frontier Army and the Destruction of the Buffalo: 1865-1883" (PDF). Western Historical Quarterly. 25 (3): 312–338. doi:10.2307/971110. JSTOR 971110. Retrieved April 6, 2015. ^ Farr, William E. (Spring 2004): "Going to Buffalo. Indian Hunting Migrations across the Rocky Mountains. Part 2". Montana, the Magazine of Western History, Vol. 54, No. 1, pp. 26-43. p. 42. ^ a b Hämäläinen, Pekka (2008). The Comanche Empire. Yale University Press. pp. 294–299, 313. ISBN 978-0-300-12654-9. ^ King, Gilbert (July 17, 2012). "Where the Buffalo No Longer Roamed". Smithsonian Magazine. The Smithsonian. Retrieved April 7, 2015. ^ Kennedy, Michael (1961): The Assiniboine. Norman, p. LVII. ^ Gilman, Carolyn and M. J. Schneider (1987): The Way to Independence. Memories of a Hidatsa Indian Family, 1840–1920. St. Paul, p. 228. ^ Fowler, Loretta (1987): Shared Symbols, Contested Meanings. Gros Ventre Culture and History, 1778–1984. Ithaca and London, p. 67. ^ Fletcher, Alice C. and F. La Flesche (1992): The Omaha Tribe. Lincoln and London, p. 51. ^ Fletcher, Alice C. and F. La Flesche (1992): The Omaha Tribe. Lincoln and London, p. 33. ^ a b Bergman, Brian (February 16, 2004). "Bison Back from Brink of Extinction". Maclean's. Retrieved March 14, 2008. For the sake of lasting peace, let them kill, skin and sell until the buffaloes are exterminated. ^ Foran, Max (1982). Calgar, Canada's frontier metropolis: an illustrated history. Windsor Publications. p. 26. ISBN 978-0-89781-055-5. ^ Patten, James I. (January–March 1993): "Last Great Hunt of Washakie and his Band". Wind River Mountaineer. Fremont County's Own History Magazine, Vol. IX, No. 1, pp. 31–34. ^ Gilmore, Melvin R. (1931): "Methods of Indian Buffalo Hunts, with the Itinerary of the Last Tribal Hunt of the Omaha". Papers of the Michigan Academy of Science, Arts & Letters, Vol. 14, pp. 17–32. ^ Fox, Gregory L. (1988): A Late Nineteenth Century Village of a Band of Dissident Hidatsa: The Garden Coulee Site (32WI18). Lincoln. ^ Farr, William E. (Spring 2004): "Going to Buffalo. Indian Hunting Migrations across the Rocky Mountains. Part 2". Montana, the Magazine of Western History, Vol. 54, No. 1, pp. 26–43. pp. 39 and 41. ^ Farr, William E. (Spring 2004): "Going to Buffalo. Indian Hunting Migrations across the Rocky Mountains. Part 2". Montana, the Magazine of Western History, Vol. 54, No. 1, pp. 26–43. p. 43. ^ Fowler, Loretta (1987): Shared Symbols, Contested Meanings. Gros Ventre Culture and History, 1778–1984. Ithaca and London, p. 33. ^ Fowler, Loretta (1987): Shared Symbols, Contested Meanings. Gros Ventre Culture and History, 1778–1984. Ithaca and London, p. 63. ^ Ostler, Jeffrey (Spring 2001): "'The Last Buffalo Hunt' And Beyond. Plains Sioux Economic Strategies In The Early Reservation Period". Great Plains Quarterly, Vol. 2, No. 2, p. 115. ^ a b King, Gilbert (July 17, 2012). "Where the Buffalo No Longer Roamed". Smithsonian Magazine. The Smithsonian. Retrieved April 7, 2015. ^ "Black Kettle". New Perspectives on The West. PBS. 2001. Retrieved April 7, 2015. ^ a b c Duval, Clay. "Bison Conservation: Saving an Ecologically and Culturally Keystone Species" (PDF). Duke University. Archived from the original (PDF) on March 8, 2012. Retrieved April 13, 2015. ^ a b Jawort, Adrian (May 9, 2011). "Genocide by Other Means: U.S. Army Slaughtered Buffalo in Plains Indian Wars". Indian Country Today. Indian Country Today. Retrieved April 7, 2015. ^ a b c Smits, David (Autumn 1994). "The Frontier Army and the Destruction of the Buffalo: 1865-1883" (PDF). The Western Historical Quarterly. 25 (3): 312–338. doi:10.2307/971110. JSTOR 971110. Retrieved April 7, 2015. ^ Jawort, Adrian (May 9, 2011). "Genocide by Other Means: U.S. Army Slaughtered Buffalo in Plains Indian Wars". Indian Country Today. Indian Country Today. Retrieved April 7, 2015. ^ Duval, Clay. "Bison Conservation: Saving an Ecologically and Culturally Keystone Species". Duke University. Retrieved April 13, 2015. ^ Hubbard, Tasha (2014). "Buffalo Genocide in Nineteenth Century North America: 'Kill, Skin, Sell'". Colonial Genocide in Indigenous North America. Duke University Press. p. 294. doi:10.1215/9780822376149-014. ISBN 978-0-8223-5779-7. ^ Harjo, Suzan (2014). Nation to Nation: Treaties Between the United States and American Indian Nations. Smithsonian Books. p. 101. ISBN 978-1588344786. ^ Parker, Z. A. (1890). "The Ghost Dance Among the Lakota". PBS Archives of the West. PBS. Retrieved March 30, 2015. ^ Jawart, Adrian (May 9, 2011). "Genocide by Other Means: U.S. Army Slaughtered Buffalo in Plains Indian Wars". indiancountrytodaymedianetwork.com/2011/05/09/genocide-other-means-us-army-sl. Indian Country Today. Retrieved April 12, 2015. ^ Laduke, Winona (1999). All Our Relations: Native Struggles for Land and Life (PDF). Cambridge, MA: South End Press. p. 140. ISBN 978-0896085992. Archived from the original (PDF) on April 2, 2015. Retrieved March 30, 2015. ^ Laduke, Winona (1999). All Our Relations: Native Struggles for Land and Life (PDF). Cambridge, MA: South End Press. p. 146. ISBN 978-0896085992. Archived from the original (PDF) on April 2, 2015. Retrieved March 30, 2015. ^ Laduke, Winona (1999). All Our Relations: Native Struggles for Land and Life (PDF). Cambridge, MA: South End Press. p. 147. ISBN 978-0896085992. Archived from the original (PDF) on April 2, 2015. Retrieved March 30, 2015. ^ Linderman, Frank B. (1974): Pretty Shield. Medicine Woman of the Crows. Lincoln and London, p. 20. ^ Linderman, Frank B. (1974): Pretty Shield. Medicine Woman of the Crows. Lincoln and London, pp. 38, 167 and 173. ^ Linderman, Frank B. (1974): Pretty Shield. Medicine Woman of the Crows. Lincoln and London, pp. 168–169. ^ Hearst Magazines (January 1931). Popular Mechanics. Hearst Magazines. pp. 1–. ISSN 0032-4558. Retrieved September 16, 2011. ^ American Bison, U.S. Fish and Wildlife Service. Retrieved December 3, 2010. ^ Staff (December 2011 – January 2012). "Restoring a Prairie Icon". National Wildlife. National Wildlife Federation. 50 (1): 20–25. ^ National Bison Range – Dept of the Interior Recovery Activities Archived February 20, 2013, at the Wayback Machine. Recovery.doi.gov. Retrieved on September 16, 2011. ^ American Bison Society > Home Archived May 30, 2013, at the Wayback Machine. Americanbisonsocietyonline.org. Retrieved on September 16, 2011. ^ "Where the Buffalo Roam". Mother Jones. Retrieved on September 16, 2011. ^ "Ranches". Tedturner.com. Archived from the original on December 15, 2010. Retrieved November 11, 2013. ^ Robbins, Jim (January 19, 2007). "Strands of undesirable DNA roam with buffalo". The New York Times. Archived from the original on April 16, 2009. Retrieved March 14, 2008. ^ Polzhien, R.O. ; Strobeck, C.; Sheraton, J.; Beech, R. (1995). "Bovine mtDNA Discovered in North American Bison Populations". Conservation Biology. 9 (6): 1638–1643. doi:10.1046/j.1523-1739.1995.09061638.x. JSTOR 2387208. ^ Halbert, N.D.; Ward, T.J.; Schnabel, R.D. ; Taylor, J.F. ; Derr, J.N. (2005). "Conservation genomics: disequilibrium mapping of domestic cattle chromosomal segments in North American bison populations" (PDF). Molecular Ecology. 14 (8): 2343–2362. doi:10.1111/j.1365-294X.2005.02591.x. ISSN 0962-1083. PMID 15969719. Archived from the original (PDF) on July 10, 2012. Retrieved March 14, 2008. ^ Halbert, Natalie Dierschke (2003). "The utilization of genetic markers to resolve modern management issues in historic bison populations: implications for species conservation" (PDF). Archived from the original (PDF) on September 26, 2007. Retrieved March 14, 2008. ^ a b c Patel, Moneil (June 1997). "Restoration of Bison onto the American Prairie". UC Irving. UC Irving. Retrieved April 7, 2015. ^ "American Bison and American Indian Nations". Smithsonian Institution National Zoo. Smithsonian. Retrieved April 7, 2015. ^ Higgins J, Stuber T, Quance C, Edwards WH, Tiller RV, Linfield T, Rhyan J, Berte A, Harris B (2012). "Molecular epidemiology of Brucella abortus isolates from cattle, elk, and bison in the United States, 1998 to 2011". Appl. Environ. Microbiol. 78 (10): 3674–84. doi:10.1128/AEM.00045-12. PMC 3346378. PMID 22427502. ^ "Once-In-A-Lifetime Permits" (PDF). Utah Division of Wildlife Resources. Archived from the original (PDF) on November 11, 2010. ^ "Alaska Hunting and Trapping Information, Alaska Department of Fish and Game". Wc.adfg.state.ak.us. Archived from the original on August 21, 2009. Retrieved February 19, 2011. ^ "Alaska Hunting and Trapping Information, Alaska Department of Fish and Game". Wc.adfg.state.ak.us. Archived from the original on October 1, 2009. Retrieved February 19, 2011. ^ "Alaska Department of Fish and Game". Adfg.state.ak.us. Archived from the original on August 24, 2010. Retrieved February 19, 2011. ^ "Alaska bison hunt near Delta Junction". Outdoorsdirectory.com. Retrieved February 19, 2011. ^ staff (March 3, 2010). "Restoring North America's Wild Bison to Their Home on the Range". Ens-newswire.com. Retrieved February 19, 2011. Dobak, William A. (1996). "Killing the Canadian Buffalo, 1821–1881". Western Historical Quarterly. 27 (1): 33–52. doi:10.2307/969920. JSTOR 969920. Dobak, William A. (1995). "The Army and the Buffalo: A Demur". Western Historical Quarterly. 26 (2): 197–203. doi:10.2307/970189. JSTOR 970189. Flores, Dan (1991). "Bison Ecology and Bison Diplomacy: The Southern Plains from 1800 to 1850". Journal of American History. 78 (2): 465–85. doi:10.2307/2079530. JSTOR 2079530. Isenberg, Andrew C. (1992). "Toward a Policy of Destruction: Buffaloes, Law, and the Market, 1803–1883". Great Plains Quarterly. 12: 227–41. Koucky, Rudolph W. (1983). "The Buffalo Disaster of 1882". North Dakota History. 50 (1): 23–30. PMID 11620389. McHugh, Tom. The Time of the Buffalo (University of Nebraska Press, 1972). Rister, Carl Coke (1929). "The Significance of the Destruction of the Buffalo in the Southwest". Southwestern Historical Quarterly. 33 (1): 34–49. JSTOR 30237207. Roe, Frank Gilbert. The North American Buffalo: A Critical Study of the Species in Its Wild State (University of Toronto Press, 1951). Shaw, James H. (1995). "How Many Bison Originally Populated Western Rangelands?". Rangelands. 17 (5): 148–150. JSTOR 4001099. Smits, David D. (1994). "The Frontier Army and the Destruction of the Buffalo, 1865–1883" (PDF). Western Historical Quarterly. 25 (3): 313–38. doi:10.2307/971110. JSTOR 971110. Archived from the original (PDF) on July 25, 2011. Retrieved May 2, 2011. and 26 (1995) 203-8. Zontek, Ken (1995). "Hunt, Capture, Raise, Increase: The People Who Saved the Bison". Great Plains Quarterly. 15: 133–49.